Growing up as a kid in Indiana in the late 80's, I remember the 1984 Topps John Elway rookie card wasn't too popular in the area. Fans were still ticked off that he'd dodged Indy to play for the Denver Broncos. But Elway went on to an amazing career in Denver anyway. And nowadays his rookie card is extremely popular with collectors everywhere. Nine Pro Bowls and two Super Bowls goes a long way in boosting your popularity. Elway's rookie is not one of the most valuable football cards but it is a key to the 1984 Topps set and one of the most popular football cards in the hobby. That said, here is a comprehensive guide that covers the key things you should know before you buy. Distinction: This is his only recognized mainstream rookie card. There is a 1984 Topps sticker as well and a rare minor leaguue baseball card issue. But this is the John Elway rookie card everyone knows about. It's one of three keys to the set. The Dan Marino and Eric Dickerson rookie cards are the others. Number: This is card #63. Design: Topps went with a vertical layout but gave the cards in its 1984 football set a tilt to the left within their thick white borders. so it can look awkward when you see one. 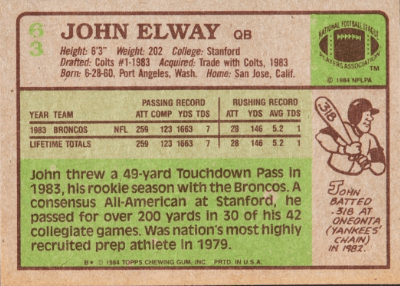 Reverse Side: The reverse side of the card is printed with a horizontal layout and features Elway's personal information and passing/rushing stats from the 1983 season. The lime green coloration scheme makes it a bit tough to read the #63 in the upper left that noted Elway's position in the set. Topps also mentions his accomplishments as a standout at Stanford and brief stint in the New York Yankees Minor League baseball system. Condition Issues: The card can sometimes be off-centered and the corners can be a bit prone to showing wear easily. The first thing most collectors ask is: how much is a John Elway rookie card worth? Most know that sports cards from the 1980's aren't worth as much as older vintage cards. Heavy distribution meant that many were printed and their values plummeted as a result. But even though it's relatively easy to find, some can still go for top dollar if they're in mint or pristine condition. Professional grading is the easiest way to help judge a card's value and Professional Sports Authenticators (PSA) are usually thought to be the benchmark in that industry. John Elway was one of the greatest quarterbacks to ever play the game. He didn't put up the jaw-dropping stats that today's quarterbacks do but remember he played in a different era under different rules. Elway played in an era that was not as pass-heavy as today. In total he spent 16 seasons in the league and put up 51,475 yards and 300 touchdowns. He also earned 9 Pro Bowl trips and won 2 Super Bowls. He was most famous for his ability to control a game and comeback from behind to win. In all, he had 47 fourth quarter comeback victories. He was inducted into the NFL Hall of Fame in 2004 in his first year of eligibility.